Ice-Cream in That Flavor? Seriously???? OMG!!!!!!!!!!!! The last time I was grossed out like this, it was after looking at a video about boils bursting on YouTube! LMAO!! You are not going to believe some of these flavors that critics are saying we need to try this summer. LIES (as Tamar Braxton would say)! Elvis’s favorite sandwich toppings of peanut butter, bananas, and bacon get swirled into ice cream for the Velvet Elvis at Arrabelle in Vail, Colo. Fresh bananas and housemade candied bacon add alternating soft and crunchy textures to this excessive homage to the King. 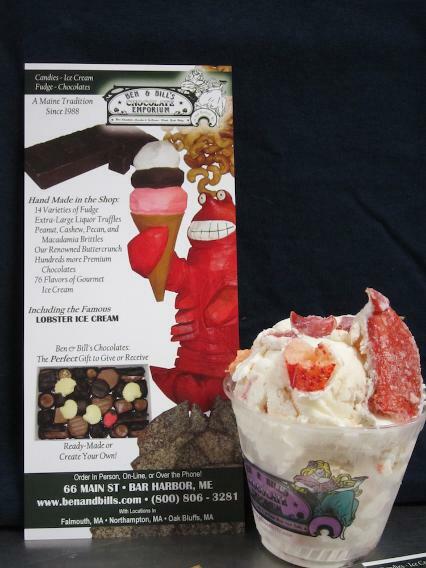 Handfuls of fresh, buttered lobster meat are folded into a butter-flavored ice cream base at Ben & Bill’s in Bar Harbor, Maine. It has been serving this novelty since 1988, handing out the savory samples to skeptical tourists seeking a more adventurous dessert alternative to lobster rolls. 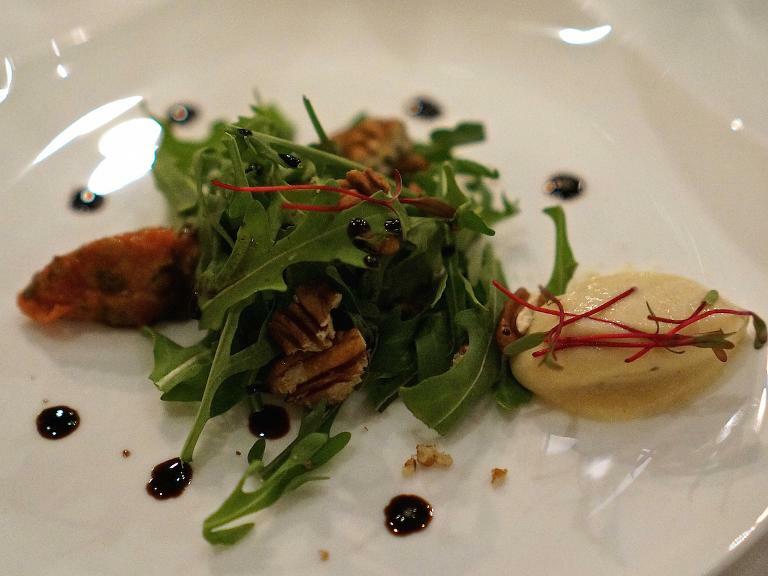 Who needs dressing when you can get a quenelle of onion ice cream with your arugula salad? At Cancún’s Le Basilic in Mexico, the sweet, creamy ice cream melts into peppery arugula and tart tomato confit for a fresh start to a fine-dining meal. 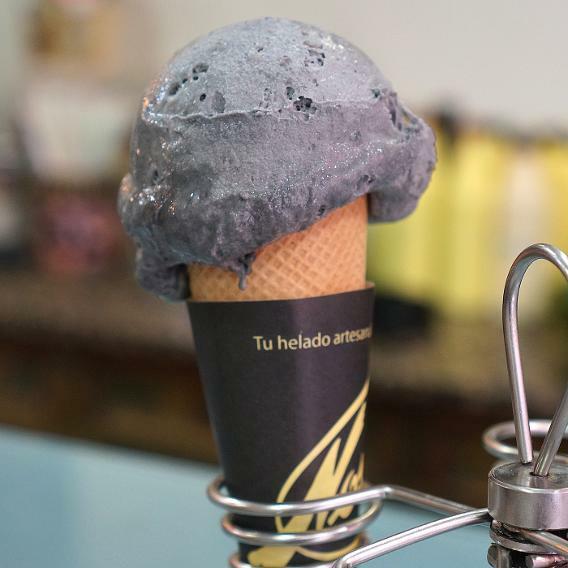 Order the ice cream sampler “gastronomika” at Bilbao’s Heladería Nossi-Bé for savory gourmet flavors including squid in its own ink, cod pil pil and kalimotxo, which is red wine with cola. 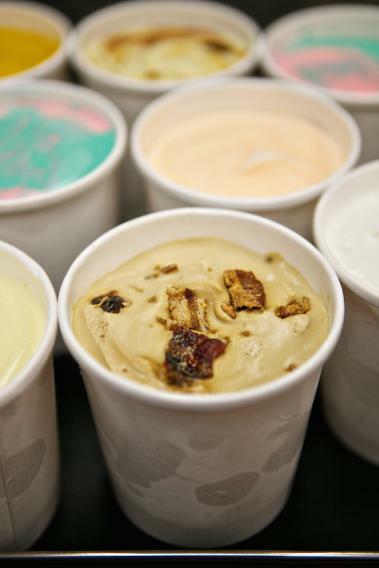 There are actually bits of squid and fish in the ice cream, and it’s certainly interesting for a couple of bites. We prefer the Idiazabal sheep’s milk cheese ice cream with walnuts and quince paste, like eating an entire cheese plate tossed into a blender. YOU’VE GOT TO BE KIDDING ME!!!!!!!!!!! Just these few made my stomach hurt. Who would…how do you…why did they…..I CANNOT! Review the entire list with additional pics at https://www.yahoo.com/travel/weirdest-ice-cream-flavors-c1432066374299/photo-kimchi-and-rice-photo-1432066368580.html. 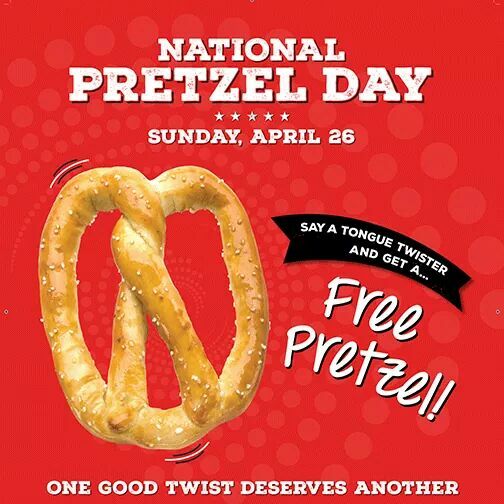 Get Ready for Slightly Salty Deliciousness for FREE! Two things I love are now combined in a healthy and tasty dessert; sweet potatoes and chocolate. Yummy! I can’t wait to sink my teeth into these. Let us know if you try it and what you think! This description, recipe and pictures are found at deliciouslyella.com. She has many healthy recipes to satisfy your taste buds. If asked what my favourite foods in the world were the list would be: sweet potatoes, dates, cacao, raw brownies and avocado. So it seems only natural to try and combine at least four of the five in some way to create something insanely awesomely, which is exactly what I did in these sweet potato brownies. I have to admit that when I made these I was beyond excited, like really way too over excited. I was jumping around a lot, making a lot of ‘mmmmm… delicious… wow… these are outrageous… can you believe it’ type noises! Anyway I was so excited that I told everyone that would listen about my new creation – but the response was a little mixed, most people seemed to think the idea of making dessert from a vegetable was too bizarre and maybe I’d taken my healthy baking a step too far! But I absolutely promise you that I haven’t and that you will adore these, it is impossible not to. 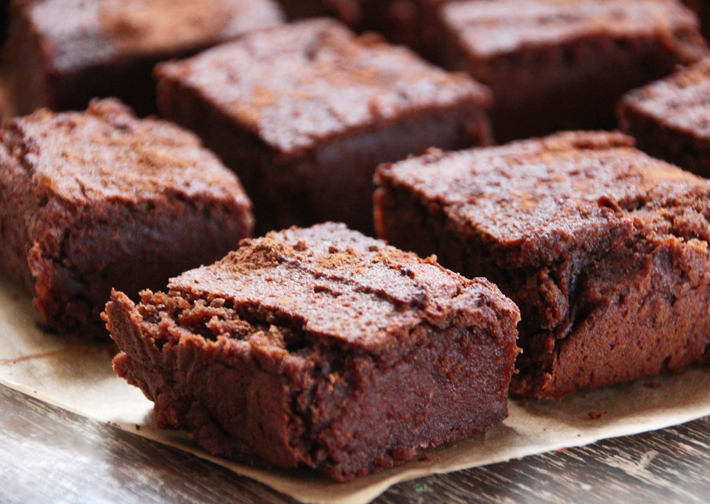 They are the sweetest, gooiest, softest, most moist, chocolatey brownies ever. And even better they make you feel incredible as guess what they only contain six totally natural, totally unrefined, absolutely healthy ingredients! Sweet potatoes, almonds, buckwheat, dates, raw cacao and a little agave. How crazy is that! The mixture is also so heavenly that you will want to eat the whole thing with a spoon, seriously – just the mix of pureed sweet potatoes and dates is enough to send you straight to food heaven. It is unreal. Licking the bowl is also one of the highlights of being vegan as you don’t have to worry about getting sick from the raw eggs! Anyway I am so head over heels in love with this recipe and have so many plans right now for this mix of ingredients – they’ll be sweet potato muffins, scones, cakes and pancakes coming your way very soon! Just because these taste insanely sweet and decadent doesn’t mean they’re not loaded with goodness though. Sweet potatoes are incredible: they’s bursting with nutritional goodness with all their antioxidants, and their anti-inflammatory properties, as well as being awesome blood sugar-regulators. Each cup contains an almost unrivaled amount of vitamin A, with more than four times your daily need of this antioxidant boosting vitamin, which is essential for strengthening your body’s immunity against infection. Their bright colour also doses you up on anti-inflammatories which have been shown to reduce inflammation on the brain and nerve tissue. 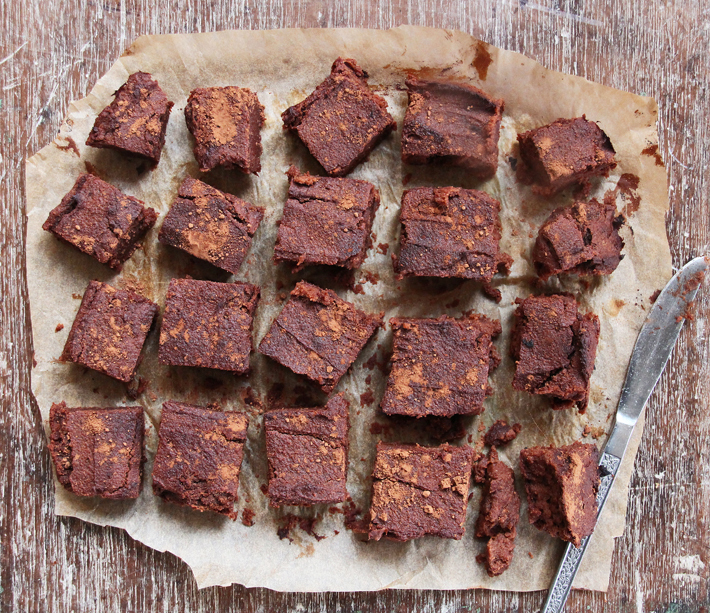 Each serving also contains lots of wonderful fibre, which gives each brownies a ‘slow burning’ quality, meaning their energy is used up much more slowly than low-fibre carbohydrates – like normal brownies, so you’ll be fuller, more energised and more satisfied for way longer! 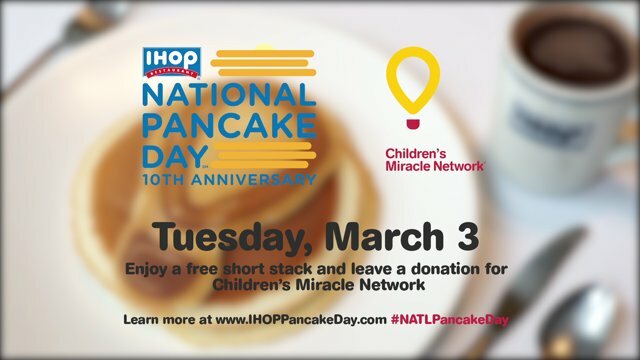 So if you needed an excuse to eat brownies then here it is! They’re healthy! Don’t forget that raw cacao is also a superfood as it is such an insanely rich source of antioxidants, one of the best in the world, as well as being packed with a number of other beneficial nutrients: manganese, which helps oxygenate the blood; magnesium, which helps maintain healthy bodily nerves, muscles and bones; and sulphur, which builds strong nails and hair, and promotes beautiful skin. Start by pre-heating the oven to 180C, then peel the sweet potatoes. Cut them into chunks and place into a steamer for about twenty minutes, until they become really soft. Once they are perfectly soft and beginning to fall apart remove them and add them to a food processor with the pitted dates – this will form one of the sweetest, creamiest, most delicious mixes ever! Put the remaining ingredients into a bowl, before mixing in the sweet potato date combination. Stir well. Place into a lined baking dish and cook for about twenty minutes, until you can pierce the brownie cake with a fork bringing it out dry. 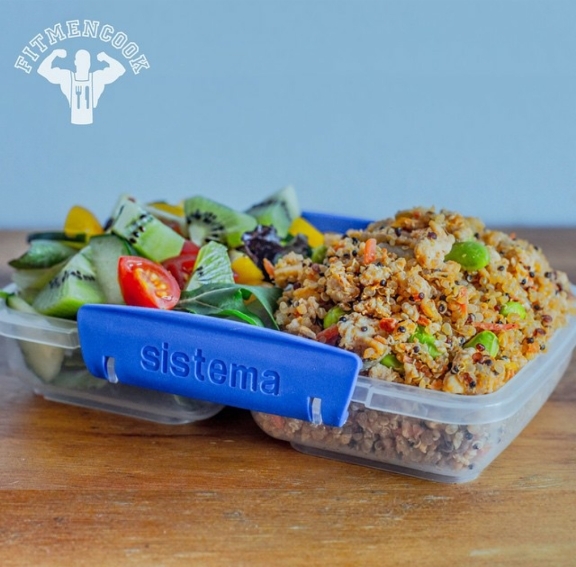 Remove the tray and allow it to cool for about ten minutes – this is really important as it needs this time to stick together! Remove the brownies from the tray, leaving it another few minutes before cutting them into squares – then dig in and enjoy! This recipe and pic are from the article posted on Yahoo by Christine Arel. I love a good chili and then this one is healthy on top of it. Christine says this recipe will serve 8. Enjoy and post your pics of the finishing product so we can see it. Heat oil over medium heat in a Dutch oven. Add onion, garlic, bell pepper, and jalapeños; sauté for 3-5 minutes until onions are softened and translucent. Add turkey and cook until browned, about 7 minutes. Add beans, tomatoes (with liquid), chile and garlic powder, paprika, and oregano, combining well. Add salt to taste. Lower the heat, cover, and let chili simmer for about 45 minutes, allowing flavors to develop. Serve with pepper jack cheese and cilantro. I absolutely love these less than 35 calories snacks! The original recipe is 99 calories when you use regular wonton wrappers and margarine, but to make them quicker I use the Athens brand mini fillo shells. 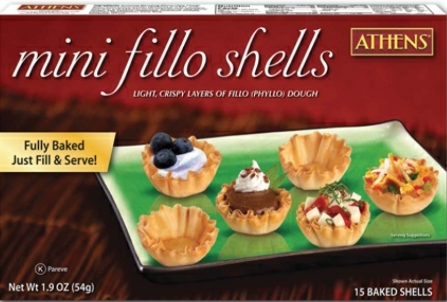 That’s just mini phyllo shells. Fill the bottom of the shell with about a teaspoon of strawberry or raspberry spread. 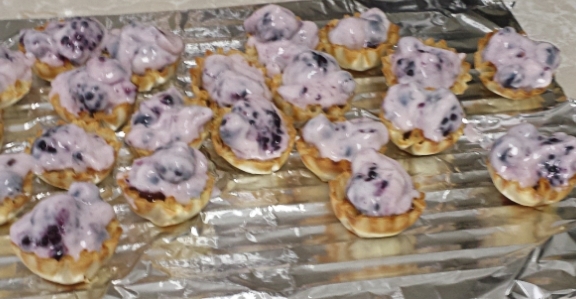 Fold berries (I used blueberries and blackberries) into fat-free lemon yogurt and place on top of the spread in the shell. Then, voila! It’s time to eat. You can also place a berry on top of it, but I ran out of time before work. I love his colorful and nutritious dishes! This one is part of his meal prep. Chicken fried quinoa, spinach, kiwi…the flavors just burst on your tongue. Show your tongue some love today!